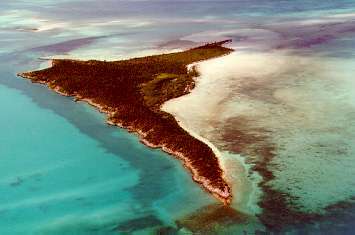 The preliminary plan is as follows: after we've raised enough money through online businesses and/or other means, we'll buy a tropical island, probably in the Bahamas (at the moment, a prime candidate is Cockroach Cay (see picture below), an 80 acre, US $ 700,000 island), a couple of boats and auxiliary equipment. Estimated total: US $ 1,000,000, to be split among 50 - 100 people. Some basic rules will have to be set for the shared use of the property, but basically you can come and go and do what you please, as long as you don't harm the others, wreck the environment or somehow endanger the project. This is not supposed to be a real "commune"; only things that have to be bought collectively (because individual members can't afford them) are used collectively. As for the social aspect: everyone can decide for himself how much he wants to interact with the others. An 80 acre island is big enough to provide everyone who wants it with ample privacy. Even if 100 people participate in the project, it is very unlikely that more than 30 will ever occupy the island at once, save for some special occasions such as international transhuman gatherings etc. The core group of more or less permanent inhabitants will likely be approx. 10 - 20 persons, with others dropping by whenever they feel like it/can afford it. To preserve the island's natural beauty, it would probably be best to build one or two small holiday-style appartment complexes for the permanent inhabitants and visitors, while leaving the rest of the island relatively untouched and park-like except for some parts with fruit trees, a vegetable garden etc. Another possibility would be using a floating habitat, moored alongside the island, to live in. There would have to be at least one (brick and concrete) building with a spacious cellar on the island however, to offer shelter in case of a hurricane or some other mishap. If all goes well, there will after a couple of years be enough money made from collective and individual businesses, some of which may be based on the island, for the next phase: an autonomous micronation, located on an artificial island somewhere outside the 200 mile Exclusive Economic (maritime) Zone of neighboring countries. Ideally, it would be contructed from floating/fixed concrete structures moored/built atop some shallow spot like a sand bank or coral reef (for stability). See also New Utopia and Oceania for examples of respectively fixed and floating sea structures. Unlike on the Bahama island, where there would still be certain government restrictions, there would be only rational rules in this place. Whether it's taking "regulated" drugs (for recreation or medication), keeping and bearing arms, choosing euthanasia and perhaps having your body frozen afterwards, undergoing gene therapy, gambling, conducting useful but "controversial" research or having an abortion, it's all possible. An oasis of reason in an overregulated, hypocritical world. In time, other communities would be founded around the world, mostly on deserted islands and such, so that the Transtopians could travel around (by boat and plane), do business, maybe temporarily resettle and meet like-minded people without most of the bureaucratic hassles commonly associated with visiting other regions. In case of trouble, one could always fall back on the main settlement; the autonomous, ocean-based city state Transtopia. Of course, as soon as this becomes possible, the true freedom seekers will move to space. Incidentally, this would not only provide unprecented autonomy, but might also be one of the best tactics to deal with the Singularity. Therefore, space migration will be a major focus point of the Transtopia project as soon as it becomes physically and financially attainable. This will probably take at least another decade, and in the meantime an island community will have to do. Of course, should there be breaktroughs in (affordable) space technology within the next few years, the (second) island project might be abandoned in favor of a space colony, since the latter offers far superior possibilities for aquiring wealth and freedom. If you have questions, comments and general feedback regarding the project or this website, feel free to email us. If you want to get actively involved, the mailing list is the place to be. Some general rules for interaction, a proto-constitution if you will. The basis of this document should be something like "do what you want as long as you don't harm or endanger the other members of the group" (aka the Golden Rule). Since harming "outsiders" could very well trigger retaliatory attacks from people with a lot more firepower than yourself, this should clearly be avoided, except in cases of self-defense of course. The "constitution" should be further be kept as simple as possible; after all, freedom-loving pioneers don't like rules and regulations anyway, that's one of the main reasons why they've become pioneers in the first place. Research into law of the sea. Keeping a low profile beats any law when it comes to avoiding conflicts with governments, btw, but this may not be always possible. After all, you'll have to make a living, and some of the most lucrative businesses (like gambling) are also a sure way to attract unwanted attention from governments and criminals alike. The risk can be spread however by having a remote home base, and operating special "hedonism ships" (with gambling facilities etc.) just outside the 12 (>24? See: Part II Territorial Sea and Contiguous Zone, Section 4, Article 33) nautical mile government jurisdiction zone, or, if you want to play it safer still, outside the 200 nautical mile Exclusive Economic Zone. See also the article The Last Free Place on Earth by T.O. Morrow for some legal issues regarding autonomous artificial islands on the high seas. 1. In the exclusive economic zone, the coastal State shall have the exclusive right to construct and to authorize and regulate the construction, operation and use of: (a) artificial islands; (b) installations and structures for the purposes provided for in article 56 and other economic purposes; (c) installations and structures which may interfere with the exercise of the rights of the coastal State in the zone. 2. The coastal State shall have exclusive jurisdiction over such artificial islands installations and structures, including jurisdiction with regard to customs fiscal health, safety and immigration laws and regulations. Onother major point is the configuration of your ocean-based habitat. Will it for example be a concrete island, and if so will it be fixed to the ocean floor (on pillars like Venice), floating (with anchors to keep it in place) or a combination of the two? Other possibilities include underwater habitats and living on a large ship, which could either be some used maintainance/drilling barge, a modified cargo ship or, ideally, a medium-sized cruise ship. Pro: great stability, you won't get sea sick like on a ship or free-floating platform, has more of a real "island" feel to it, can support heavier structures, won't sink so easily. Con: shallow places are virtually always part of someone else's territory, or at least within their 200-mile exclusive economic zone. Within this zone all "produce" of the sea and sea floor can be claimed by the country it belongs to, so you wouldn't be able to fish or mine minerals etc. near your island, and worse, the "owner" of the EEZ could excercise his legal power over your posessions, see also the legal excerpt. . Living with undoubtedly harsh taxes, plenty of government regulations and the constant threat of eviction is of course no viable option. Even if your shallow spot is well within international territory, there's still the geological problem: it's probably the top of an underwater vulcano, or at least a place where the continental shelves collide, vorming an underwater mountain range. Certainly for transhumanists, who take life-extension quite seriously, living on top of a vulcano of otherwise seismically unstable area isn't exactly appealing (at least, that's what one would expect. Strangely enough there's a large concentration of transhumanists and in the L.A. region, of all places). Some other problems of a fixed platform are of course lack of mobility (but this could at least partially be fixed by having a couple of ships to do business, get supplies etc.) and the possibility that a rigid platform could be more vulnerable to bad weather than a flexible one, though this is questionable and depends on the specific design. A final problem could be the expected rising of the sea level, but by taking this into account during construction this shouldn't cause too much trouble. It must be said however, that if the abovementioned problems can be overcome, a fixed (concrete) platform is greatly preferable as a place to live to the floating configuration or ships because it's the closest thing that comes to a real island. The proposed libertarian Principality of New Utopia is a good example of the fixed platform setup. Pro: Mobility (depends on the size though), one can choose from a much wider variety of locations then with a fixed platform, and move around if necessary. The stability of a concrete island would probably be much better than that of a ship, although the action of the waves could still be felt. Unlike with a ship, you can relatively easily add on new structures, both horizontally and vertically; the island can really grow. Con: A floating platform could at least theoretically sink if damaged enough in a storm or because of structural errors. Also it could carry less superstructure, soil etc., and the wave action could cause discomfort to some inhabitants, as well as displacement of any non-attached objects, such as furniture, during rough seas. For some information about floating platforms (by Sea Structures, Inc.), click here. Pro: Good to great mobility, depending on the model of your ship. Best price-product ratio: for approx. the price of one bare concrete platform you can buy a fairly large used ship that only needs some minor repairs & refitting, but is otherwise ready to be sailed and inhabited. Because even the biggest ship might get a bit cramped after a while at sea, one could practice "island hopping", sailing to an uninhabited island of choice (and there are many), and staying there for weeks, months or even years. The government that owns the place probably doesn't mind, and in any case it it's very unlikely that anyone will even bother to patrol these remote areas. And should someone come and cause trouble, you can always leave at a moment's notice. Ideally you'd have two (or more) ships, one as a home base and one for business/supplies, but even with just one (big) ship this should be a feasible lifestyle. If you make enough money, concrete platforms or bigger ships can be bought as you go along, so that you can "settle down" if you feel the need. It might be somewhat difficult to get a ship recognized as a "nation" (but presumable not more so than a concrete platform), but a flag of convenience (Bahamas for example) combined with the ship's mobility could get you a long way to autonomy. Con: Ships can sink more easily than (large) platforms, and need perpetual maintainance to stay operational. Also you'd have considerable fuel costs, and at least some group members would have to learn how to navigate, maintain & operate a ship. Concrete platforms on the other hand are pretty straightforward. Furthermore, even big ships are very limited places to live, with little or no possibilities for expansion (but buying the biggest possible ship, like a twin-hulled barge, combined with island-hopping can make things more bearable). Last but not least. there's the problem (for some) of sea sickness. This could be somewhat alleviated by avoiding rough seas as much as possible, using a well-stabilized boat (and/or a twin hulled model, which offers more space too) and "camping" on islands as often as possible. Also there are several anti-motion sickness drugs & gadgets on the market, some of which might actually help. Maritime has a list of affordable used ships. Pro: Much easier to maintain than a ship because there are no engines and related equipment, just a steel hull with some kind of (possibly prefabricated) superstructure to live in. In this configuration, it's basically a house boat on steroids. By linking several barges to eachother you can have a small town, complete with greenhouses for growing fruits & vegetables, a small park, a swimming pool etc, just like with the floating concrete units. If you want to move around you can hire a tug, or maybe even have your own. Con: Unlike concrete islands, barges rust and will need a paint job every now and then, but this doesn't have to be a big problem. Also a barge isn't as seaworthy as a normal ship, so you'll want to moor it in a relatively quiet spot out of the way of tornadoes and such. See also Intership Limited for some pictures and descriptions of barges and related vessels. Pro: Best stability one can get, unless your island is in a geographically unstable area like Hawaii, of course. Islands provide a ready platform to build on. Also they're generally better looking than a block of concrete. Con: All (known) islands fall under some government's jurisdiction, which means true autonomy is out of the question. However, due to their relative isolation, at least some tropical islands may offer reasonably undisturbed surroundings without most of the hassles of (sub) urban life. Add to this a pleasant climate and beautiful scenery, and you have a very reasonable (temporary) compromise; natural islands could be used as an intermediate step towards autonomy on the high seas. The local government, weather and the island itself must be checked out thoroughly, of course, before any deal is made. Pro: Even at relatively moderate depths there is no or hardly any influence from the weather above; an underwater habitat remains stable trough just about any storm. Also you wouldn't have to worry too much about unwanted visitors, because an underwater structure is hard to detect, certainly for ordinary pirates and such. Con: As in a submarine, a leak could quickly have disastrous consequences, though this could be countered by compartementalizing, double hulls, emergency breathing gear in all major quarters etc. Such measures are rather expensive though, and the whole setup would be very cramped, much more so than a ship or platform. Above-water structures such as a sun deck or garden could make this kind of living more bearable, but would also at least partially compromise the secrecy and stability of the setup. Nonetheless, underwater structures migh be a useful addition to floating platforms, serving as (emergency) basements and for recreational purposes etc. Though somewhat dated, these books provide many useful tips for the beginning pioneer, and get you into the mood for adventure. Author: Jon Fisher, published by Loompanics Unlimited (C) 1980, 1985. Author: Jon Fisher, published by Loompanics Unlimited (C) 1991. Author: Erwin Strauss, published by Loompanics Unlimited (C) 1984, (2nd edition). The above titles are all available online trough Loompanics Unlimited. Private Islands "An own island? Didn't you ever dreamt about it ? Now you can let your dreams become true, because we are your specialist in private islands on the Bahamas, the Fiji's, in French Polynesia and in Belize". Pacific Island Investments "Pacific Island Investments stands ready to assist you with fabulous island and island resort inventory throughout the South Pacific". H.G. Christie Ltd. Sell private islands, beautiful secluded beaches, waterfront homes, condominiums, and more. U.S. Submarines, Inc. Manufacturers of luxury subs, tourist subs, submersibles and searoom habitats. Underwater Vehicles Inc. Sell commercial submarines, submersibles and remote operated vehicles. IYachts Has lots of excellent maritime links. The Official Homepage of the Bahamas Ministry of Tourism Various Bahamas info. Bahamas 2000.com 's Guide to the Bahamas A site with comprehensive information about business, real estate, tourism, politics and others things on the Bahamas. Bahamanet General business & tourism info. Parts of the site require membership. Rocky Mountain Survival Group - - A Survival Information Clearinghouse A site that seeks to provide a central database of practical, accurate, reliable and interesting news, articles and product information from all sources regarding self-reliance & survival. This information ranges from Day-To-Day survival tips in a technological era, to momentary crises situations, to local, regional and global catastrophe. The Right to Keep and Bear Arms -- LINKS Various gun, self-defense and freedom-related links. Buildfreedom.com "This site is for anyone interested in creative, innovative, and powerful ways to enjoy more freedom and to turn their freedom expertise into advantages in all areas of life." The Offshore Entrepreneur -- Making Money Offshore Here are a number of different roads to the creation and protection of wealth in foreign countries prepared by Adam Starchild. The Last Free Place on Earth An article on creating a sovereign territory on the high seas. Law Research -- Law of the Sea A very large collection of (links to) legal texts on this subject. The Micronations Homepage Gives an alphabetical listing of microstates with historical outlines and legitimacy ratings (1 through 5). Institut Fran�ais de Micropatrologie -- French Micropatrological Institute Has various interesting links to micronations and related topics, as well as some French texts. Micronational Links A comprehensive guide to micronation activity on the web. MicroWorld "A site about micronations, by micronations and for micronations!" Micronations on the Web A very complete, well-categorized index of micronations and related organizations. Intentional Communities "This Web site serves the growing communities movement. We provide important information and access to crucial resources for seekers of community, existing and forming communities, and other friends of community". A project for an (artificial) island nation in the Caribbean, based on futurist-libertarian philosophy. A somewhat similar libertarian project, now defunct (but the homepage is still operational and has some interesting info for pioneers). Freedom Ship A proposed autonomous community based on a large, specially designed ship that's to cruise around the world. First Millennial Foundation A project to "colonize the galaxy", starting with ocean habitats. The Artemis Project A private venture to establish a permanent, self-supporting community on the Moon. Island One Society An affiliate of the Artemis Project, which is intended as a meeting place for future space colonists and business people of a libertarian or at least live and let live bent. League of the New Worlds An organization that seeks to establish a permanent presence in the oceans and space. P.E.R.M.A.N.E.N.T. -- Projects to Employ Resources of the Moon and Asteroids Near Earth in the Near Term A very informative site about the possibilities of space colonization. Lots more links on miscellaneous topics can be found in the >H Links Collection.